Hey ya’ll. Guess who just got back from Austin. Yours truly. It was a great trip filled with friends (old & new), non-stop music, being one with the outdoors, delish eats, and just lots of good ol’ southern fun. We went to all three days of Austin City Limits (ACL) music festival which seriously rocked out for its 10th anniversary. And, we hit up two afterparties: Empire of the Sun & Foster the People DJ Set. My ears are so happy. My favorites were: Twin Shadow, Empire of the Sun, My Morning Jacket, Kanye West, Cut Copy, Ray LaMontagne, Mayor Hawthorne, Cold War Kids, and Foster the People. Glad I saw Arcade Fire but doesn’t make the top fav list for me. So, let’s talk type. 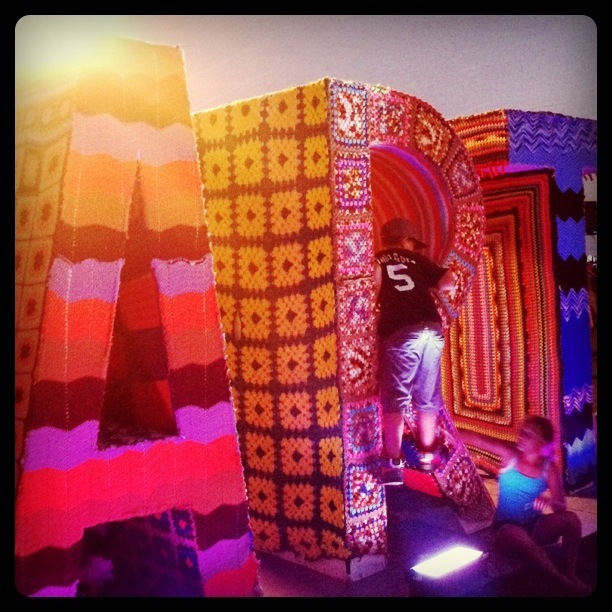 I found these colorful, knitted letters at ACL. They stand about 6 feet tall, and besides being a beautiful type installation, they are also functional. The little kiddies of ACL loved to rough house all over them. As you can see in this particular shot the little girl sitting is trying to slack the boy who is climbing. Something never change, right? Ha. Mostly I love the concept and I think the patterns are pretty stunning in that granny-handywork-kind-of-way. The message is straight to the point: ART. Enough said! !